It’s that old phrase “give ’em what they want in an unexpected way.” Easy to say, hard to do because if you keep throwing away the obvious choices, you run the risk of just doing weird or quirky for the sake of it and maybe taking the idea way off course. I like exploring this possibility when conceiving a shot because if this happens, you have no choice, you have to come up with something that not only satisfies the director but also your interest in animating the shot. You have to believe in the work you’re doing. “Emotionally authentic” is what I mean by the first section of “believable performance,” so “entertainment” is something else. “Emotionally authentic” and “believable performance” is the standard. Every shot has to have that but when you push beyond believable and do it in an unexpected way, the audience gets jolted out of their boredom. THAT’S entertaining for THEM. The audience is the one who matters. We see people being normal all day. Even worse, we see people acting normal in movies (and especially animated ones) all too much. It’s the brilliant animators/actors who turn ideas on their ear and make the audience see something that rings true, but new. There are tons of examples of Milt always searching for the most entertaining and clear pose for an action. And it’s not even always crucial shots but he continually searched for a creative way to solve problems visually. That’s just one of the reasons why people still study his drawings and scenes. As great as he was, he didn’t go with his first thought. So how to learn to be entertaining? That’s the trick, isn’t it? It’s part taste – what do you like and what do you respond to? It’s part personality – do you have your own take on things that other people wouldn’t have? It’s part observation – watch people, keep a sketchbook and STEAL their behaviors for your scenes. This is why EVERY animator should have a sketchbook to record life. It’s part discipline – don’t allow yourself to do the easy, obvious choice. Any good animator can do that so make yourself irreplaceable and bring what they aren’t thinking of. Here’s a great compilation of Cary Grant moments. (It won’t play here, but click it then click through to YouTube.) He endures as one of cinema’s greats because he repeatedly created memorable performances by doing things with his unique spin. He was an ENTERTAINER! You’ll probably want to turn off the music, but maybe you’ll like it. Notice the parts you respond to. When do you smile? (That’s you being entertained, by the way.) I bet it’s when he does things that you don’t expect. It seems like ‘the unexpected’ is a huge component of entertainment. Or maybe more ‘misdirection’. Like jokes; they’re funny because you’re lead towards an expected outcome, and suddenly you take a turn and arrive at a new association. I’ll have to explore trying to feint in one direction so I can swing from a different one. The amusing things for me with that Cary Grant clip were when he would slip out of what he was doing into something unrelated. Like standing calmly, observing casually, to smacking the hat. And also the rhythm and timing of some of his actions and gestures. It’s so nice to see you back Clay. Thank you for these posts! 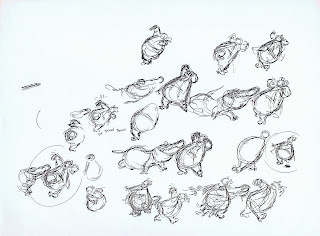 When I’m thinking of Entertainment in animation, my mind jump to Art Babbit, because it’s so difficult to do what he was doing. Breaking so many laws with goofy, the dance of the mushroom, or his angry walk! When I look at one sheet, it seems so off and yet in the animation it’s so entertaining! Thank you again Clay for these tips, looking forward your next podcast. Thanks so much for the inspiring post! I’m going to seek out some Cary Grant as the clip is no longer viewable on your website. Your passion for the medium of animation is tangible and it thrills me when a fellow artist is a proponent of learning and they take the time to share their knowledge. Do you think you’ll have the time one day to get back into podcasting? I know it takes a lot of time but what you have already is a gold mine. I’ve been locked away in my apartment for the third day in a row working on my own animated hand drawn short film. I’m sick anyway so it’s not like I could spend the long weekend out and about. I had the idea for my short 3 years ago and it’s still a work in progress. I really can’t wait to share it. Sidenote; I tend to be a pretty quiet blog reader. I visit with every update and love the information but rarely comment. I imagine many of us readers do the same. The King of animation podcasts is back! Love and questions. I’m kinda hooked on Beauty and the Beast right now. I keep going back and watching Beast. God I love him! He should have gotten the Oscar for best actor. Except I don’t think he was acting, I think he was real. Every scene he’s in, he does something that catches you — I think you could intermix Beast with Cary Grant clips here to make the same point. But I wonder, wouldn’t it happen that certain animators would make great teams and keep playing off each other through different films? Like Fred and Ginger, shouldn’t there be Beast and Belle, Cogsworth and Lumiere teams of their animators, partnered in other characters — that chemistry? That doesn’t happen, though, does it? Also, I’m several zones out from where you in the business are, and I imagine this may be a sensitive topic, but the thought of someone else animating Beast in a “cheapquel” appalls me. That’s a term I saw, and in fact I haven’t seen any of the B&B sequels to judge, but in that way I don’t want to — I’m protective of MY Beast and imagine everyone else who had a part in him would be too. I’m trying to figure out the thinking. I really don’t know clouds at all. Glad to have found this website, glad to see it going again. Any chance one of the next baby steps could be the end of the old Nik Ranieri interview? I always enjoy listening to that interview, and it would be great to hear the end. Regardless of what’s next, I’m happy to see you back! Thank you for all the work you’ve done on this site – it’s always tremendously inspirational. I think that entertainmentis an action, event or activity that aims to entertain, amuse and interest a public (“public” can consist of one person). This audience can have a passive role, as in the case of a play, a show on a TV or a movie, or active, as in the case of a video game. But I really appreciate with these video I loved to watch. Dude, where have you been?! Found your podcasts a couple weeks ago, listened up to episode 30 (can’t find 31), great stuff. In one of the last episodes, you said something along the lines that you aren’t going anywhere, and you’re going to do more podcasts, that was 3 years ago! Great stuff. Thanks for this post. I really like when he starts to do an action and then changes his mind and goes back to his original pose. It’s something we don’t always think about doing in animation. So good to have you back and already with really superb advice! Working in ads and now in features has taught me that when you’ve got tight deadlines and a huge task ahead, the most important thing to know is where to apply pressure, and this really is it! I can’t believe I hear a new podcast in the future…for now I will happily go back and re-listen to all of my old favorites and anxiously await the triumphant return of CLAY and my FAVORITE podcast ever on the best subject in the world and the true art form of my soul, animation. Perfect return topic by the way and thank you for your work on Tangled. It is a masterpiece. are there any podcasts on the way? I’m an illustrator, cartoonist and life-long illustration enthusiast. I recently discovered your podcast and have been delighted by how educational and inspirational they are. The important work that you are doing will be shared with my [high school] animation students in the fall and is enhancing my passion for animation to an even greater level than I thought possible. Thanks again for sharing everything. Please continue to make more shows! Just wanted to say thank you, I’m a UK student who opted to go for a digital animation course (which starts in a matter of days). 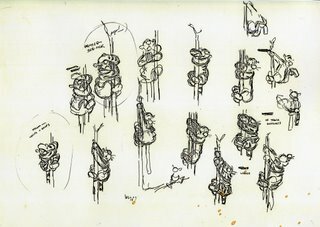 I love traditional animation and will to continue with it in my spare time, but the wealth of information on the site is priceless to those of us starting out (traditional or not). So yeah… just thanks! One thing have been bugging me lately and that’s the terms “Breakdown” and “In-between”. Many many people, me included, use these two terms interchangeably sometimes and I still dont REALLY know what the difference is. Can you clarify that for us please?